Summer is a great growing time for your lawn and garden where they come into their prime. However, as summer reaches its zenith, it’s time to start thinking about how to prepare your lawn and garden for the winter time. By getting started earlier, you and your plants will be in less of a rush come fall, and not have to worry so much about those early freezes that sometimes plague New England. Let’s look at what you can do in summer to have your lawn and garden ready for fall. After the peak of summer, it’s time to get your lawn ready for a great fall and the long sleep of winter. While fall is a time for things like fertilization and overseeding, you can also do quite a bit during the summer while your grass is still growing. Here are a few lawn care tips. If you’re not concerned about a watering bill and there isn’t a drought in your area, keep your sprinkler systems going and make sure your lawn gets all the water it needs. As long as it does, it’ll grow thicker and deeper, which will help during the winter months. Start mowing your lawn on a lower setting to make sure all the base and sprouting grass gets enough sun. Bringing the crown out of the shade will also help promote root growth, especially important for lawn aeration. For healthy grass, sometimes you may need to aerate your lawn. For fresh sod installs, recently landscaped grounds, and high-traffic areas, there can be a lot of soil compaction. This can strangle root growth and prohibit deep water penetration, so lawn aeration (plugs instead of spikes if possible) is key. It’s also a good time to get your garden ready while the soil is still warm and it’s still nice enough weather that gardening isn’t a chore. As summer wraps up, so does the growing period for most of your plants, making this the perfect time to get them ready for fall and winter. Adding Mulch: Adding mulch during the summer and fall seasons can help prevent the starting cold from getting to your plants and start providing nutrition for the long winter. 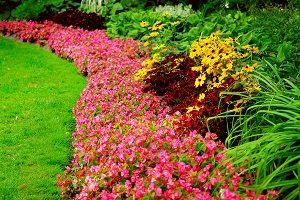 Replacing Annuals: If you’ve got spring and summer annuals, get ready to pull them out and replace them with cool-weather plants that will last through fall and winter. Replace Soil Nutrients: Summer is a time for plant growth. Make sure to replace nutrients lost in the soil by adding in compost and slow release fertilizers. Transplanting Potted Plants: If you have potted plants whose summer growth has them ready for the garden, now’s a good time to transplant them into the ground so they will sink in their roots before winter. Tidy Up the Shed: And when you’re done with getting ready for fall, now’s a good time to clean up that shed while it’s still sunny and warm. Clean and oil metal tools, and toss away old or expired products. Want to learn more about steps to get your lawn and garden ready for winter? Greener Horizon can help. We provide seasonal lawn and garden management for larger estates, as well as landscape design and construction. Contact us today to help keep your landscape looking great, year-round.